New Delhi, May 11 The 20-year-old victim that was picked up from Dhaula Kuan and raped repeatedly in a moving car is still in a state of trauma. She is slowly recovering from the shock, said the police officials. “She starts crying while recalling the entire episode. With the help of an NGO, we are trying to get more details from her so as to make a perfect portrait of the culprits,” added the officials. With the arrest of six persons, the Economic Offence Wing of Delhi Police claimed to have busted a gang that has allegedly cheated people out of Rs 80 lakh. The accused have been identified as Bhagirath Singh (58), Kaushalya Dabas (54), Mahavir Prasad Gupta (48), Krishna Bansal (45), Rai Singh Rana (47) and Anita Rana (43). 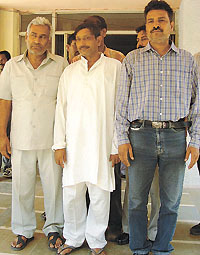 FACE OF CRIME: The gang of cheats in the police net in the Capital on Wednesday. The police have arrested four persons for having gang raped a newly-married woman reported to be the wife of their friend in Wajid Pur village. The crime took place in Yamuna Khadder near Wahid Pur village. A land scam involving illegal transfer of 25-bigha public land in 1971 has been unearthed in village Bilaspur, Greater Noida. Hundreds of students of Delhi Public School, Maruti Kunj, were not allowed to enter their classes by the former employees of Maruti Udyog Ltd. The employees were protesting against the school authorities for not exempting their wards from the hike in the fees this academic year. A 95-year-old woman died in the All India Institute of Medical Sciences (AIIMS) of bacterial meningitis taking the toll since the outbreak of the disease a week ago to 18 while the city hospitals reported 36 new admissions today. The state government has taken a bold decision to bring one-lakh hectare of barren land under the plough for which Uttar Pradesh Chief Minister Mulayam Singh Yadav has announced the formation of Bhumi Sena (land army). The National Institute of Applied Management (NIAM), New Delhi celebrated their third anniversary ‘Sankalp’ on Sunday at Siri Fort Auditorium. It was a moment of pride and achievement for the students and the faculty alike. It is an attempt to accumulate information about ‘hidden treasures’. The Indira Gandhi National Center for Arts (IGNCA) for the next two months will go looking for rare manuscripts in possession of individuals, societies and libraries in the national Capital. The Delhi trading community is infuriated over the ‘uncomplimentary’ remarks made by the Empowered Committee on VAT Secretary Ramesh Chandra against its members. Do you know that ‘bombs’ are fitted in the vehicles, where your kids are going to schools everyday? Yes, we are talking about the rampant use of illegal gas kits in the vehicles by the private operators. The body of Kamarrudin, the Dasna jail prisoner, who had died in the jail in mysterious circumstances, has been dug up from grave after the facts highlighted in the first post-mortem pointed to his having been murdered. A man, who allegedly cheated political aspirants out of lakhs of rupees by promising them seats in the Rajya Sabha and MLA tickets, has been arrested. Enhancing the involvement of MLAs in solving the problems related to water supply in the Capital, the legislators can now spend up to Rs 2.5 lakh from their MLA fund instead of Rs 50,000 earlier to carry out repair work and a call centre will be set up by the Delhi Jal Board exclusively for them to air their grievances. The 20-year-old victim that was picked up from Dhaula Kuan and raped repeatedly in a moving car is still in a state of trauma. She is slowly recovering from the shock, said the police officials. “She starts crying while recalling the entire episode. With the help of an NGO, we are trying to get more details from her so as to make a perfect portrait of the culprits,” added the officials. The police sources said that they are trying to locate a building where the culprits changed the car. The building was displaying a huge advertisement hoarding. “She has told that it was a congested area and there were buildings at the two ends,” the officials said. Her statement, according to the officials, reveals that the culprits crossed four districts in three hours, i.e. Southwest to South district then to Central, Northeast and back to Nanakpura via Ring Road. They were in two cars with glasses coated with black films. According to the police officials, the girl said that she was forced into the car. She noticed a road sign mentioning Daryaganj. During the entire episode, the assailants jumped at least 20 police barriers while a number of PCR vans moved around the city. He said that the first PCR call informed us that a college girl was picked up from the Dhaula Kuan area and taken to the forests of Palam Vihar. So the police were directed to comb that forest area. Although the PCR was also alerted, it appeared that the culprits had used the bylanes to escape. According to some senior police officials, there are directions from the commissioner office to further strengthen the security system. The three joint commissioners of have been given asked to tighten the vigil on roads. Besides, the PCR vans have also been directed to act promptly. The police sources said that the action was taken after the incident had been denounced by the members in both Houses of Parliament. The Joint Commissioner of Police, North Range, Mr Deep Chand said, “Delhi Police have sufficient security arrangements in the city. All that is needed is to work efficiently and promptly. More pickets have been installed,” he added. When the police tried to arrest the accused in the Nangli Puna area in Northwest district, a mob armed with lathis and stones attacked the policemen injuring two of them. The police said that the accused took money from the people on the pretext of doubling it in just 40 months. The accused were reportedly running a company, M/s Ronnie Finance Ltd at Kundan Bhavan, Commercial Complex, Azadpur. After getting complaints from the people, a team was constituted under the supervision of ACP M.K. Sharma, EOW of Crime Branch, who arrested the accused after investigation. The police claimed to have seized some documents that prove the shady activities of the accused. As many as 20 victims have been examined in this case so far. During investigation, it was also revealed that Bhagirath Singh Dabas is a postgraduate teacher in Senior Secondary School; Mahavir Prasad Gupta is a trained graduate teacher in Sarvodaya Vidyalaya; and Rai Singh Rana is a primary teacher in a corporation school. The police have seized seven bank accounts of the company and also registered a separate case in the local police station of Samay Pur Badli for attacking the police party. A youth of Asgaspur village had married a girl from Bhangel and it was a love marriage. The man had also introduced his wife to his close friends who had been earlier told of their love affair. On Monday evening, when the man and his wife were going from Bhangel to Asgaspur to meet the family of his husband, his friends Sonu and Shakil and two other friends waylaid them on Wajid Pur village road. Later, the four pounced upon the man, beat him up seriously and took his wife to Yamuna Khadder and raped her turn by turn, the police said. When the police reached there, the four miscreants fled away. But on the basis of the husband’s written complaint, Sector-39 police nabbed all the accused, Sonu, Shakil, Raju and Raj Singh. Further investigations are on. A fraud case against 10 persons, including an ex-registrar has been filed in Dankaur police station by the Naib Tehsildar Subash Chander Yadav for their involvement in fraudulent transfer of 25 bigha government land. It is learnt that Rakesh, Rajveer, Rameshwar, Satya Prakash, Raj Singh, Raja Ram, Rai Chander, Hari Singh had got the land under Gatta No. 223, which was registered in the name of Vinoda Bhave, transferred to their name in 1971, with the connivance of the then Registrar Raghuvar Singh. Later, an inquiry was held when some people raised objection to it. It came to light that fictitious entries had been made in the documents, which had been tampered with. After that Naib Tehsildar Subash Yadav had filed a case in Dankaur police station against all these people. An inquiry against a Sub-Inspector of Kasna police station, where 11 cops have been suspended for torturing three Dadri junk dealers to death, has been ordered by SP M. P. Singh. This inquiry has been ordered into the alleged beating up of an accountant posted in Javer Tehsil and his death in suspicious conditions. Padam Singh, the accountant, died after remaining ill for a long time in a private hospital. Padam Singh had died in the hospital a few days after he was beaten up by the SI. The inquiry has been assigned to Circle Officer Sarvanand Yadav. According to a report, Padam Singh, originally from Dharbara village, had been suffering from lever problem and on leave for three months. A few days ago, Padam Singh had gone to get medicine from a private hospital in Greater Noida. As he was feeling weak, he lay down near hospital gate. When Sub-Inspector Shriniwas Pathak walked in, he had hit Padam Singh with baton to make him move away from the hospital gate. At this, Padam Singh reportedly identified himself as a tehsil accountant, but by that time SP Pathak hit him with baton three four time more. Five days after this incident, Padam Singh reportedly breathed his last in the hospital. When his family members went to file a report in the police station no policeman attended to them as the complaint was against their own department. The police, however, sent them back by offering to meet all expenses from treatment to the cremation of the deceased Padam Singh. On Tuesday, when the matter was highlighted, SP M. P. Singh ordered a probe. He said the accused SI will not be spared, if found guilty in probe. The school authorities have advanced the summer vacation from today. According to the schedule, the vacation was to start from May 13. The Delhi Public School Society (DPSS) runs the school along with Maruti Udyog Ltd near village Bhondsi. As per the agreement between the two, the employees of Maruti Udyog get some concession if they put their wards in the school. The employees have taken Voluntary Retirement Scheme (VRS) and are technically no more working with the company. But they have been agitating for the past few days as their wards have not been exempted from the new fee structure of the school. The school authorities allege that the students were not allowed to come out of their school buses for more than an hour. The protestors did not even allow students to get down from the buses and drink water. The senior wing of the school is about half a kilometre from the main gate of the school (near primary section). The buses were stopped near the primary section on account of which the students had to walk the entire stretch in the scorching sun. The school authorities lamented that many of the protestors were outsiders and had nothing to do with the school. Ms Nishi Gupta, Principal of the school, alleged that the agitators behaved in this manner even though a decision on their demand is still to be taken by the school management. Meanwhile, several parents have objected to the incidents. They have called for strict action against the miscreants. Also, they have urged upon the DPSS Management not to allow the standard of the school go down on account of the present or former employees of the Maruti Udyog Ltd. The woman from Kalkaji in South Delhi, Raj Kaushalya, died this morning, said Municipal Corporation of Delhi’s hospital administration chief Dr J N Banvalikar. With 36 more patients showing up in the hospitals, the number of people admitted with suspected meningococcal infection has risen to 162, he said. The 18 deaths have been reported from Lok Nayak Jaiprakash Narain Hospital (7), Hind Rao Hospital (4), AIIMS (3), Lal Bahadur Shastri Hospital (2) and Bhagwan Mahavir Hospital and Deen Dayal Upadhyay Hospital, one each. According to a report, before bringing it under the plough, the barren land will be reclaimed and made suitable for cultivation. In a meeting called especially for the formation of the ‘Bhumi Sena’, the Chief Minister said: “Within three years, we have to reclaim one lakh hectares of barren land and make it suitable for cultivation, afforestation, water bodies and drainage system. The Chief Minister also voiced concern over the declining agricultural production in the state during past few years. One reason of this is shrinking cultivable land area in the state. And secondly, the soil fertility for unit has also gone down. Increased agricultural production is a must for supply of sufficient grain to the people. Cultivable land and soil fertility and productivity need to be increased, he said. Bhumi Sena will help the state to solve the problem of unemployment also to a great extent. “I am seeing grain crisis for the whole of India in days to come,” Mulayam Singh Yadav said. In collaboration with the National Mission for Manuscripts (NMM), the IGNCA is tabulating information about these rare manuscripts with the objective of, “preserving the national heritage”. “There are at least three to four million rare manuscripts in the country today, but they are in a state of deterioration with not many people being able to preserve them. Some of these which are even difficult to decipher contain invaluable knowledge,” said Prof. G C Tripathi of the IGNCA. Volunteers and public announcements are being used to invite information on manuscripts that are more than 75 years old. “We have divided the city into five zones and have 250 volunteers to do the job. We are trying to reach out to the individuals and organisations in possession of these manuscripts to allow us to collect information,” said Prof. Tripathi. and priceless documents, it will not confiscate them. “Unless somebody wants to donate them or sell them to us, we will not keep them with us. Our teams will analyse these manuscripts and if the owners permit us, we will like to have them on microfilms or digitise them,” he said. The survey, which is currently under way, will help collect information on how many manuscripts there are in the city and in what condition. “These are store houses of information on ancient wisdom, arithmetic, medicine, rituals and culture. By getting them on microfilms, we can preserve them and disseminate their contents to the masses at large,” pointed out Prof. Tripathi. The Delhi traders today expressed resentment over the statement made against them by the Empowered Committee Secretary at a CII seminar on VAT here yesterday when he castigated them. The Secretary had said, ‘’Delhi traders are taking consumers for a ride by not issuing invoices’’ and that the ‘’unscrupulous elements exceed scrupulous elements in Delhi’’. The traders regretted that such ‘uncalled-for’ remarks were made in the presence of Delhi Finance Minister Dr A.K. Walia. In a meeting convened by apex trading body Confederation of All India Traders (CAIT), the CAIT Delhi State president Suresh Bindal and General Secretary Narender Madan informed that the meeting took serious note of what it termed as the ‘uncalled-for’ criticism by making sweeping remarks to tarnish the image of the traders as a whole. The trade representatives recalled that the revenue of the Government under the Sales Tax Law continued to register an increase, rather it exceeded budgetary targets fixed by the State Government. ‘’It itself provides a solid proof and base to offer a strong rebuttal to the insinuations passed against traders,’’ they said. Meanwhile, other leading trade bodies of Delhi, including the Federation of Delhi Trade Associations, Federation of South Delhi and New Delhi Traders Association, Federation of Walled City Traders Association, Federation of Karol Bagh Traders Associations, and Delhi Retail Trader Forum also assailed Mr Chandra’s statement. CAIT Chairman Vijay Goel and national secretary general Praveen Khandelwal said the VAT Acts of different states reflected large-scale variations in terms of tax rates and VAT provisions. The school transport provided by the private operators in the town and the district has largely come as a major risk to thousands of kids who travel daily to their school and back, as the safety norms have been given a go-by. Hundreds of vans and three-wheelers plying here do pose a danger to their occupants not only health wise, but could become a cause of an accident anytime. Majority of the vans ferrying the schoolchildren have reportedly been running on illegal gas kits. Thanks to the slackness on the part of the authorities concerned. It is alleged that there is a nexus between the transport operators and the police. Though the district transport department do check such vehicles and perhaps has a fair knowledge of the vans and other vehicles ferrying passengers in legal or illegal manner, but the fact seems to have become a cause of unlawful income for some of the corrupt officials as there has allegedly been a setting between the concerned authorities and the system. Several vehicles, which do get challaned occasionally, however, get back on the road after an understanding is reached between the operators and the law-keepers. “Almost 99 per cent of the Maruti Vans engaged to carry the schoolchildren are running on local-made gas kits using the domestic gas (LPG) cylinders, which is otherwise not allowed,” said a driver of such a van on condition of anonymity”. He, however, claimed there is no choice for the private transporters than to get the LPG kit (unapproved) get installed in their vehicles as it was only option left for them, as the cost of the approved gas kit is at least seven times more. And further, with no authorised LPG gas station in the city and it is not possible for anyone to get refill from Delhi every time. The van and taxi operators use the domestic LPG cylinder openly and do pay the fine if caught by the authorities concerned, if one has no tie-up with the police or other officials concerned, he added. It may be recalled that several incidents of vehicles catching up fire have taken place in the NCR in the past couple of years and majority of such vehicles have been running on illegal LPG kits. Though majority of the schools here do have their bus fleet, but for many students, the bus service is either costly. The three-wheelers operating on diesel or with outdated engines have been largely responsible for the rising air pollution on the city roads. “Their use as school transport have been quite risky for the kids who inhale dangerous fumes, besides the danger of meeting an accident anytime,” says K. L. Gera, a social activist. Alleging that the district administration has failed to take any action against the thousands of such polluting vehicles, he said there has been a pressing need of switching over to clean fuel like CNG, when Faridabad is already one of the ten most polluted cities of the country. The district authorities had decided that a second post-mortem be conducted on the body of the prisoner who had allegedly died after he was beaten up in his jail barrack on May 3. The CMO, M. P. Singh has constituted a panel of doctors for the second post-mortem. The first post-mortem, which was conducted on May 4, had given strangulation as the cause of death. The jail authorities had reported the matter to Mussori police so that Kamarrudin’s killer could be identified. Riazzuddin, father of the deceased, has filed an FIR in Mussori police station, alleging that his son Kamarrudin had been sent by Indirapuram police to Dasna jail where he was strangulated. The district administration has started a fresh inquiry into the case. The accused M.S.Khan, who claimed to be the chairman of Sonia Gandhi Mother of Secularism Foundation, had taken Rs 5 lakh from one Ajay Kumar Chopra by promising to secure a Rajya Sabha ticket for him. He had even forged ‘recommendation letters’ from five Members of Parliament and submitted them to Rashtrapati Bhavan in 2003, police said. However, Chopra got suspicious after sometime and asked for his money. Khan then allegedly threatened to kill him if he did not remain quiet. Chopra approached the police and Khan was arrested by the Special Cell of the Delhi Police yesterday after a two-year-long investigation. The decisions were taken at a meeting called by Chief Minister Sheila Dikshit of all MLAs to discuss the problems faced by them regarding the water supply in their constituencies. It was decided that to deal with any exigency arising in terms of water supply due to summer, the limit of assistance that can be given from the MLA funds be enhanced from Rs 50,000 to Rs 2.5 lakh, officials said. A special cell, with a call centre, to be headed by Member (Administration) of DJB, will be created to look into the problems and complaints reported by the MLAs. The officials quoted the Chief Minister as having assured the MLAs that the Board would consider changing the sewer policy to allow sewer lines to be laid in the unauthorised colonies which have been regularised, unauthorised colonies as well as urban villages. The issue of Sonia Vihar plant also came up for discussion, and Mrs Dikshit is reported to have stated that her government was in touch with the Union Ministry for Water Resources for calling a meeting with UP Chief Minister Mulayam Singh Yadav for procuring water for the plant from the neighbouring state. Jawaharlal Nehru University in collaboration with the Ministry of Education, People’s Republic of China has announced the establishment of a Confucius Institute in the Center for Chinese and South East Asian Studies of the School of Languages, Literature and Cultural Studies.